1931 Solano sunk as a breakwater near Antioch, California (she is still there today). Steering: Four rudders at each end of the boat, controlled by a steering lever in each pilot house which operates a valve and uses a steam driven hydraulic pump to move a piston connected to the rudders. 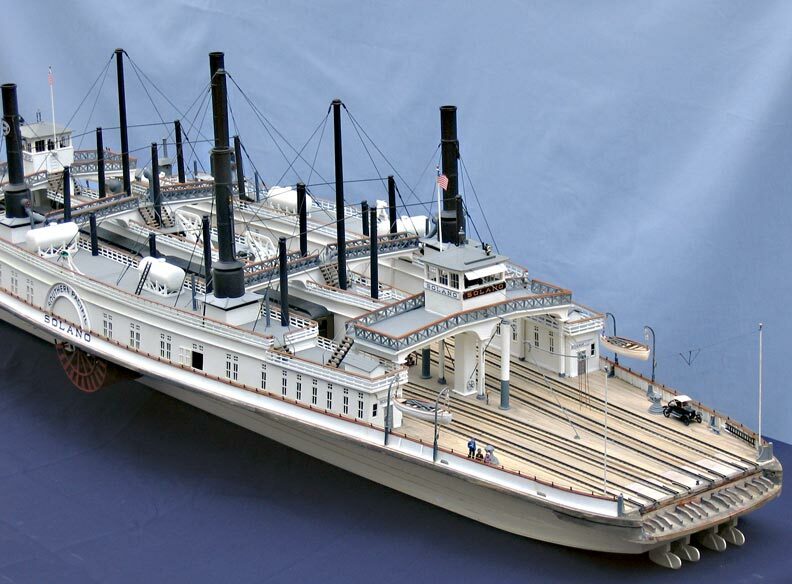 Location: Carried entire trains across the Carquinez Strait between Benicia and Port Costa, California, on the Central Pacific and the Southern Pacific mainline connecting Sacramento with Oakland (San Francisco), California on the extension of the original Transcontinental Railroad. Description: 1 mile crossing, 8 foot average tide, 13 foot extreme tide, 8 miles per hour bi-directional current. Fog was of main concern. 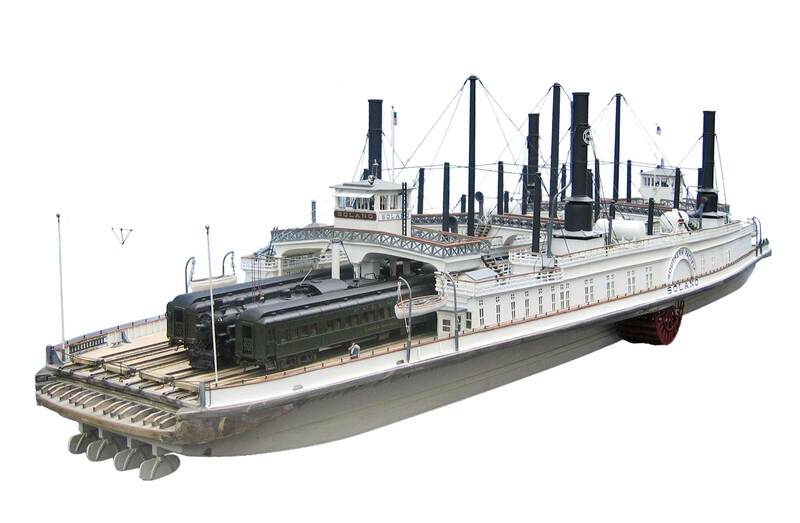 In 1904 she handled approximately 115,000 freight cars and 56,000 passenger cars in one year. (that is averaging 315 freight cars and 153 passenger cars daily, 365 days a year). In 1904 she was making thirty six to forty six crossings every 24 hours (that’s averaging a trip every 31 to 40 minutes, day and night, seven days a week, 365 days a year). October 8, 1909, Time Table shows 23 scheduled passenger trains crossing on the Solano per day. "Solano Facts" and Solano Model Images Courtesy of Bill Rubarth.